Today at Qualcomm’s AI Day in San Francisco we saw the reveal of the new Snapdragon 665 and Snapdragon 730 SoCs and platforms. The new chipsets represent updates to Qualcomm’s mid-range and upper-mid-range line-up in the 0 and 700 series. In the last year we’ve seen Qualcomm be particularly active in these segments, pushing out new platforms in extremely quick fashion. Seemingly the reason for this quick succession is that these product segments are extremely cut-throat in terms of price sensitivity, and having new products exactly tailored to customer’s needs often will give one the competitive edge and the desired design wins. Starting off with the new Snapdragon 665, the new chipset represents a direct update to the Snapdragon 660 announced back in 2017. 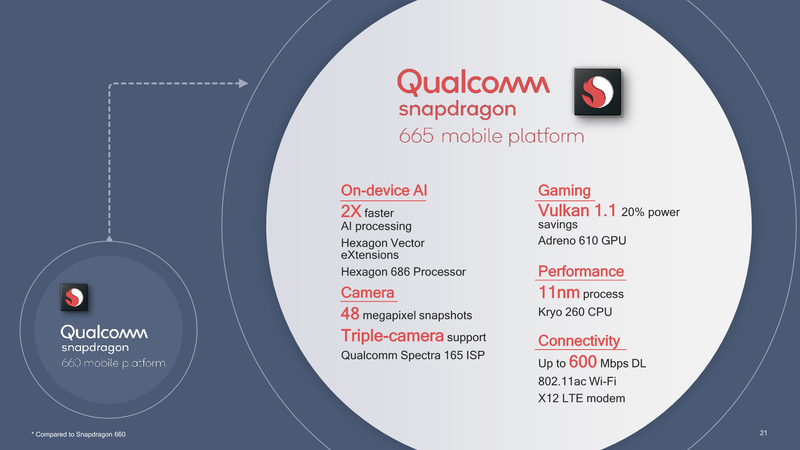 Qualcomm’s positioning here is quite weird as the new S665 isn’t as highly positioned as the S660 was back then; the Snapdragon 665 instead yet again creates a lower-end within the mid-range 0 series, but then again it’s still positioned higher than the 630 or 650’s series of past. 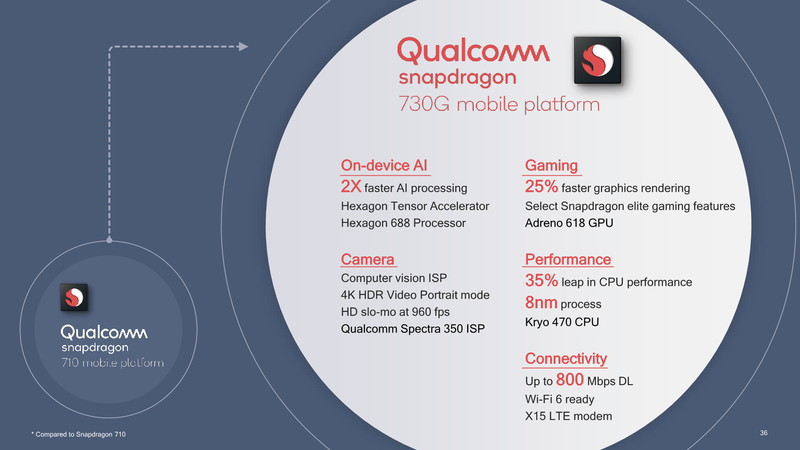 On the CPU side, not much has changed in comparison to the Snapdragon 660: There’s still 4x Kryo 260’s based on Cortex A73’s plus 4x Cortex A53 based cores. In fact the new chipset’s clock is actually lower, featuring only 2GHz big cores versus the 2.2GHz predecessor. The small cores are still clocked in at 1.8GHz. On the GPU side however we see big upgrades with the new Adreno 610 GPU which should be a big generation jump. The Hexagon DSP also has seen a generational upgrade to a new 686 block. Memory controller, media capabilities as well as the modem remain the same. What is to be noted however is that the new chipset is upgraded to an 11LPP manufacturing process which should bring power savings and cost reduction compared to its predecessor. The Snapdragon 730 is a more interesting generational upgrade. Here the new chipset is seemingly a successor to the Snapdragon 710 announced last year. We actually expected this chipset for a while, but were surprised Qualcomm announce the Snapdragon 675 instead last October. The odd thing about the S675 announcement was that it came with a CPU combination that was inherently superior to the higher tier Snapdragon 710. The new S730 now solves this weird positioning situation as it now also upgrades its CPU microarchitecture to a “Kryo 470” CPU configuration, which is based off Arm’s Cortex A76 CPU µarch. The cores are clocked at 2.2GHz and are accompanied by 6x Cortex A55 cores at up to 1.8GHz. We also see a new iteration of the Adreno GPU in the form of the Adreno 618. The new unit promises 25% increased performance over its predecessor. 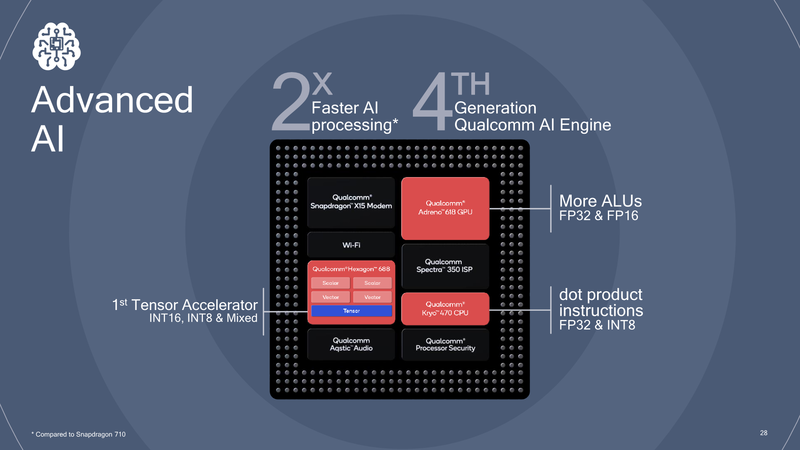 Important for the Snapdragon 730’s differentiating factor is the fact that it comes with the latest generation Hexagon 688 DSP which includes Qualcomm’s new Tensor Accelerator units for machine learning inferencing. The new chip’s imaging capabilities are also top-tier with the inclusion of the Spectra 350 ISP, including CV (computer vision) acceleration. 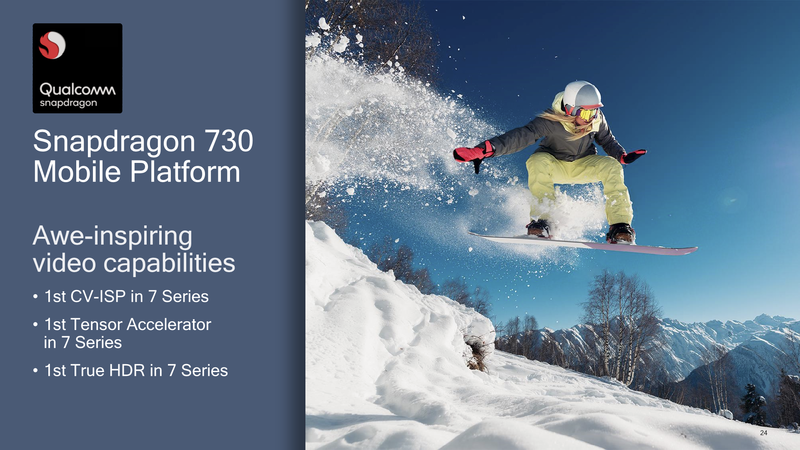 In fact the inclusion of these high-end features that we tend to see in the flagship 800 series is the 700 series’ key characteristic: Providing the same features within a lower performance and more cost-effective package. The new Snapdragon 730 is also Qualcomm’s first chipset manufactured on Samsung’s new 8nm LPP manufacturing node which represents a second-to-best process choice for this generation. Qualcomm will also deliver a Snapdragon 730G variant of the chipset promising 15% greater graphics performance, a bin variant of the Snapdragon 730 with higher clock speeds. The new chipsets are expected to be available in commercial devices in mid-2019.